What photography techniques are you going to use this summer to take better pictures? An Evolutionary Worldview: Are We Going Back To An Artisan Society? What Are You Working Those Long Days And Weeks For Anyway? Can You Really Get Big-Time Nationwide Publicity As A Creative Entrepreneur? What Makes You A Bestselling Author? Always wanted to be a published author? Imagine... everything is possible when you dream. One of my old friends once told me, in a heated argument, “with you everything is always about business”. I was caught off guard, and didn’t have a response at all at the time. I do now, I think. It’s simple. She was right: with me everything is always about business. The problem with doing what you love is that it becomes an integral part of life. The work versus life separation isn’t as clear, if it exists at all. With a strict work-life balance in place, it’s much easier to do something you absolutely hate. When you dislike your job, the line between work and life is typically very clear, overcompensating on the other end of the spectrum to make up for what you miss. That model is not sustainable. The dissatisfaction with work eventually will spill over into the personal side of things. Doing what you love means you could do it all the time, and my work is always present somewhere in the back of my mind. Everywhere I go, I’m consciously or subconsciously collecting stories for an upcoming book or article I’m writing. Even when I don’t have my camera with me, which doesn’t happen very often, I still see unique photo opportunities. It’s the way my mind operates. Loving my job and being passionate about the work I do, means I sometimes lose sight of the other areas of life, which are equally important. But it’s not just the popular duo of work versus life. Happiness is a delicate balance between all areas of life, all of them being equally fulfilling and contributing to your overall happiness. 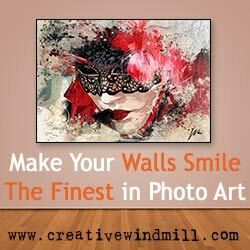 My work is just part of my passion that shows in all areas of life, no matter what I do. If that idea turns you off, you’re probably in the wrong line of work and not doing work that’s in alignment with your passions. Curious to read more? 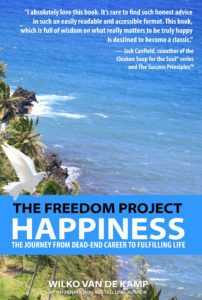 This post contain a short excerpt from my best-selling book The Freedom Project – Happiness – available through Amazon and finer book retailers worldwide. Who do you know that could use a little more balance and happiness in their life? Get them a copy of my Happiness book, available now worldwide on Amazon. For those who live in Canada: the book is also available on Amazon Canada! If travel was free, where would you go? Where Was This When I Created My First Online Course? Living by Experience (ISSN 2369-1271) is a weekly Travel, Lifestyle and Photography Magazine. Learn more.